Molly Hill-Campagna followed a friend to a new shop selling fixed up Vespa scooters and wanted one of her own as soon as she saw the old motor bikes. She'd liked them ever since she watched Audrey Hepburn zip through Rome with Gregory Peck in "Roman Holiday." Shop owner Percy Oaks, who has been selling more from his Buffalo 66 scooter garage and shop since gas prices have climbed to $3 a gallon, clinched the $3,000 deal when he offered to paint and buff the battered gray 1964 Vespa in any color. She chose pistachio green. "It's just what I was feeling. It's the right kind of color for that era," said Hill-Campagna, 36, owner of two Elmwood Avenue businesses eight blocks away from each other. "It just seemed like the most fuel efficient and quickest way to get around my little world. "Sales of motor bike scooters, some with small engines that go 30-miles-an-hour or more, automatic transmissions and a step-through that allows for skirt wearing riders, have risen with gas prices. Across Europe, with $5-a-gallon gas, traffic and parking problems, the scooters that get 50 to 100 miles to the gallon number 20 million, according to Vespa. Conditions in the U.S., where 800,000 are projected to be on the road by the end of this year, are speeding up, the company said. Rising gas prices and traffic and parking congestion are signs of promise for the scooter trade, said Paolo Timoni, Manhattan-based president of Vespa-maker, Piaggio Group Americas. "So clearly we believe the U.S. market is in its infancy," said Timoni who knows of plans to open new Vespa dealerships near Albany. 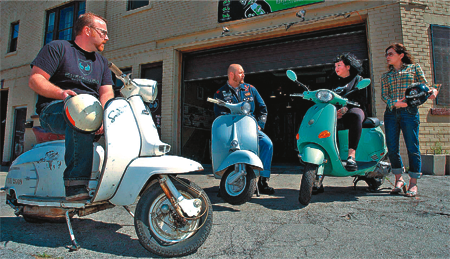 There are no Vespa dealers in Buffalo, where other brands of new scooters, such as Honda, Suzuki and Yamaha, are sold at motorcycle dealers. Scooter sales of all kinds jumped from 42,000 in 2000, the year Piaggio returned to the states after a nearly two-decade hiatus, to an estimated 113,000 last year, according to the Motorcycle Industry Council. Movies have helped maintain scooters' appealing image of cool: From Italian films, such as Fellini's 1960 La Dolce Vita, to Nicole Kidman's commute through New York City on a yellow Vespa in 2005's the "Interpreter." "Hollywood also somehow embraced Vespa motor scooters," said Timoni. "This is what is helping to sustain the brand." People in dense urban areas, such as New York where sales have gone up by 100 percent in the last year for Vespa, have been among the most responsive to the trend. In Western New York, people are slower to take to the idea. "I wouldn't ride a scooter," said Chad Ebhart, a salesman at Freewheeling Cycle on Military Road. People here drive too fast, he said, and that practice is at odds with slower scooter speeds. Each year Ebhart's store sells about 20 scooters, priced from $1,900 to $6,000, often to older people and women who find the automatic transmission easier to drive than the shifting motorcycles require. "I don't think it's gone up or down," he said of the sales. Oaks is finding an eager market at his year-old garage on East Oakwood Place. Sales of the slightly used and broken-down bikes he rebuilds have jumped from one every couple of months to six in the past two. "Every bike I get in, I sell," said Oaks, 35, who spent two years working as a mechanic for Vespa in Toronto. "Parking is so much easier. Insurance is a lot less. Just the sheer fun factor. You can kind of zip around the traffic when you have a scooter," said Oaks who has a collection of scooters in various stages of repair. "They have really nice lines," he said. "I compare them to a beautiful woman, as opposed to a big burly man." Just after he spoke, a man pulled over in an SUV, complained about his "gas guzzler," and examined the two scooters parked on the sidewalk -- a $1,799 gold Bajaj from India and a 1961 Vespa for $2,599 in bluish gray. "I need one," the man said. "It's a childhood thing. It's the first thing you learn, like a go-kart." The author of a history and guide "The Scooter Book" credits such nostalgia for some of the new scooter interest. "Among the baby boomer set, those who are not as daring to go out and buy a Harley Davidson for $25,000 might want to satisfy that two-wheel urge and sort of get in on the retro scene," said Bob Woods by phone from Connecticut. "It's a different type of a status symbol for the well-heeled baby boomers. A lot of them want to sort of get into that faux biker scene. It's a little tamer, but it still takes them back to something they might have known earlier in their lives." Oaks is part of a small local crowd of riders known as "scooterists," some 40 by his count, who ride together and go to weekend rallies with vintage scooters. They notice parked scooters they don't recognize and wonder who the owners are. They also listen to the ska and soul music that the 1979 movie "Quadrophenia" famously associated with the story of tie-wearing "mod" scooter riders clashing with the leather-clad motorcycle crowd. John "Sprunch" Spurck plays scooter music at Elmwood's Off the Wall restaurant the first Friday of every month. When he goes to the bars on Chippewa Street, he has been amused that girls sometimes ignore motorcycles with flashy chrome to stop at his small scooter and ask for a ride. "You always get people pulling you aside, telling you stories," he said. April Whitney, the San Jose, Calif.-based editor of Scoot! magazine, said her subscriber numbers, now 1,100, have tripled in the past three years. The free issue cards that some dealers give out with each bike purchase have led to about 10 requests in her mailbox every day. The interest makes sense to her. Scooters, she says, are a transportation and sensory bargain. Her five-mile commute to work takes $3 gallon of gas each week. Her insurance for two scooters is $140, a deal compared to the $600 she spends to insure her car. When she and her boyfriend go shopping, they can strap four bags of groceries on the bike with bungee cords. "People in their cars, they're in some other world," she said. On her regular commute, she gets a whiff of some flower that's a cross between a honeysuckle and gardenia. "When I come around this corner, I can totally smell this plant," said Whitney, 35. "It's just freedom." Hill-Campanga has considered what it will be like driving her Vespa this summer. When people see the pistachio scooter parked on the sidewalk, they'll know where to find her as she stops between her Solid Grounds restaurant and the Quill's Apothecary lingerie and soap shop. "I work every day," she said of her scooter trips up and down Elmwood. "It's probably the only fun I'm going to have."